YOU GUYS. I am deeming this Revlon One-Step Hair Dryer and Volumnizer the best purchase of 2018/2019. I purchased it in December 2018 so it’s like straddling 2018/2019. 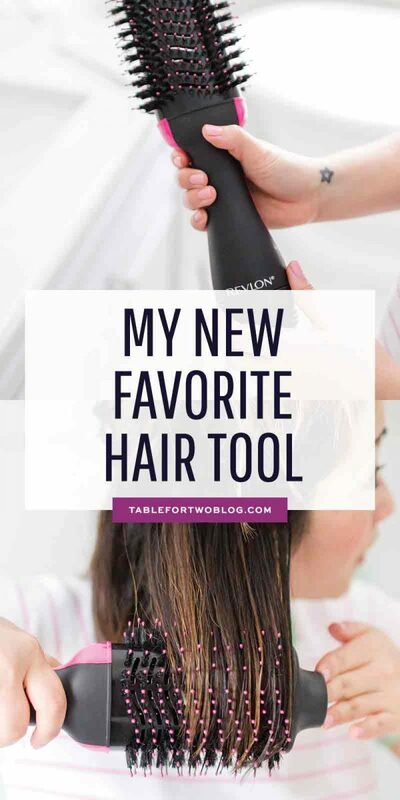 It is my holy grail hair tool, and I don’t think I can live without it. So much so that I bought a second one to keep in the closet in case my original one breaks. And what I’m saying above is certainly a very bold statement but I have never used a hair tool like this that I am so enamored with. I literally cannot, for the life of me, use a round brush AND a hair dryer at the same time. I have never been able to do it. 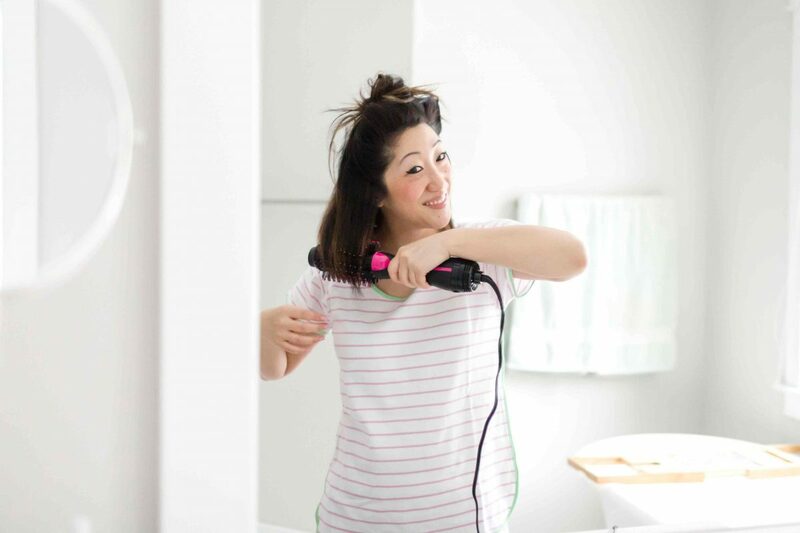 This hair dryer combines the two and makes it SO easy. I get so many compliments on my hair every time I use it, too! Of course, there are so many bloggers talking about this right now and most are sponsored/being paid by Revlon/sent the product for review. Let me throw this disclaimer out so you know I’m not bias in any way: this is not a sponsored post. I was not paid to say anything. I bought this with my own money. Why do I love the Revlon One-Step Hair Dryer and Volumnizer so much? 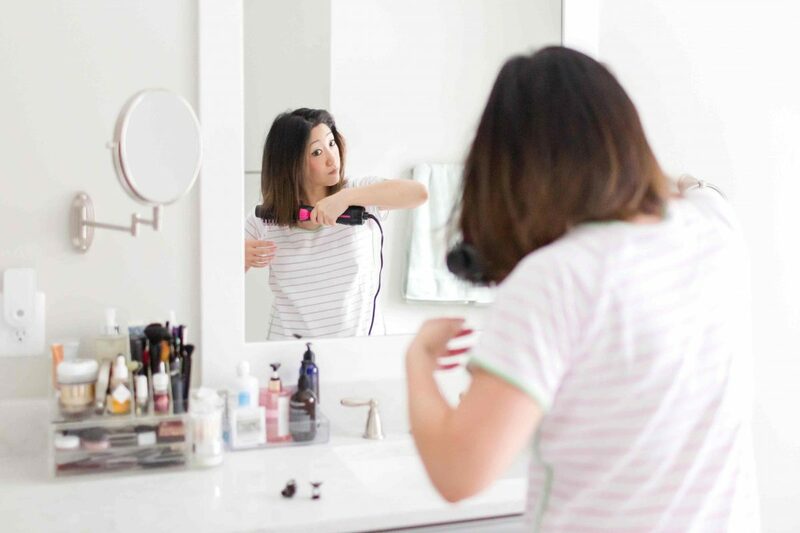 Make styling hair much easier. Makes you look like you just stepped out of a salon EVERY SINGLE TIME. Gives your hair SO MUCH volume and bounce. Okay, are there any cons? 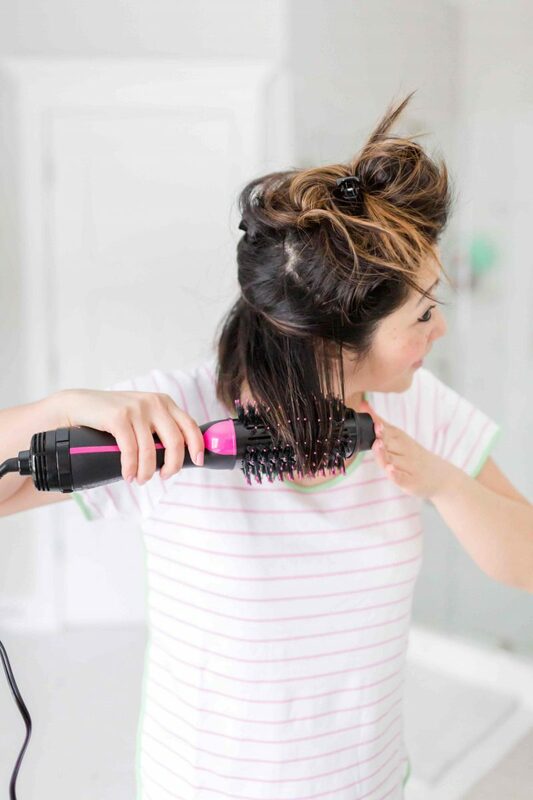 It gets hot against your skin/neck (like the air) if you hold it in a position for too long, but I kind of feel like that’s how all hair dryers are. It’s loud but I don’t feel like it’s any louder than a hair dryer or vacuum. It’s big so I have no idea how I’m going to travel with it but damnit, I’m going to travel with it. The bristles bend easily so be sure to not store it laying on the bristles. I store it upright in a basket under my sink. 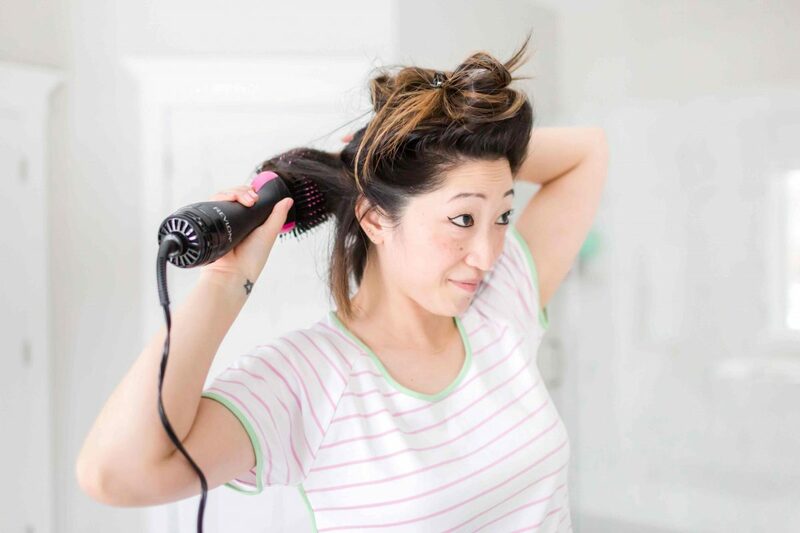 Does it dry your hair faster? I dry my hair with a regular hair dryer to 70% dry and then I finish with the Revlon One-Step Hair Dryer and Volumnizer. Is it good for all hair types? I have thick and healthy hair and I feel that it works great for it. I feel if you have thin and/or damaged hair, because of how closely the heat is applied to your hair, it might be more damaging to your hair. I would suggest if you have thin hair, maybe use a heat protectant prior. I have a post coming up on what hair products I use so I’ll be sure to link to it but for now, you can check it out on my Shop page. Does your hair stay looking volumnized and nice the day after or after you’ve slept on it? Mine flattens out a tiny bit but it still looks great. By the second day, it could use a little pick-me-up. I lightly dampen my hair with wet hands and/or spray bottle with water and then run the blow dryer through again and it seems to help give it a fresh look! 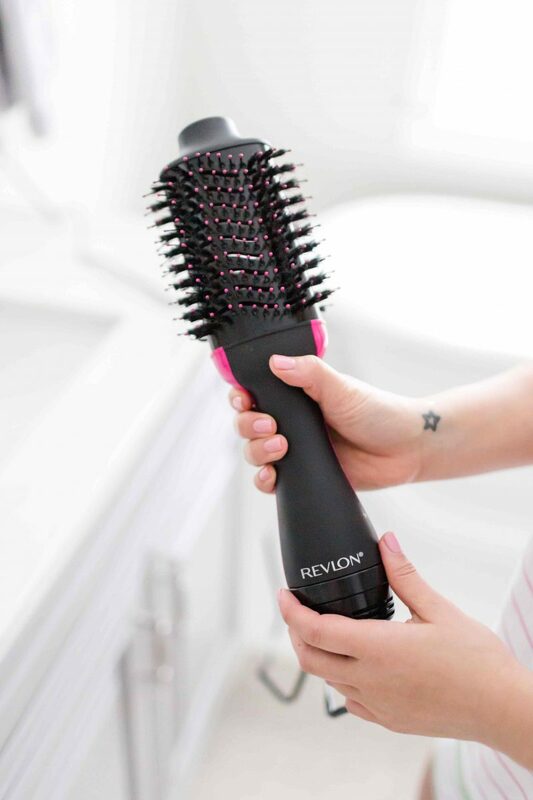 Best way to dry your hair with this Revlon One-Step Hair Dryer and Volumnizer? Like I mentioned above, I dry my hair 70% with a regular hair dryer. I suggest you section out your hair and dry your hair in sections with this hair dryer. It works best that way and it ensures that you blow dry all your hair. 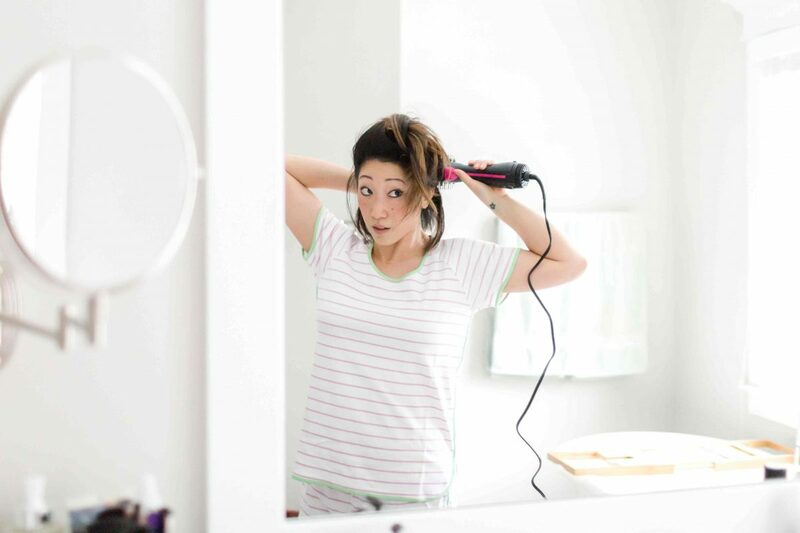 Put the barrel near your root then as you blow dry it, turn it slightly outwards and gently tug/pull down. I bought mine off Amazon for $59.99 (full price) but they regularly have sales on them. For example, my second one that I bought as a backup, I got it for $44 on Amazon. I know, it’s because everyone is talking about it right now. I know they restock it often on Amazon but if you can’t wait, you can try your local Ulta or Target or Walmart. It’s a Revlon product so I’m sure it’s readily available at regular stores. I’ll come back to update this post after I’ve used it a bit longer to give an update on durability! Hope this helps you make a decision! Worst case scenario, you hate it and you can return it but I feel like this will be a permanent staple in your bathroom. If you have any other questions, ask them below! I’m not hair savvy, so this looks it’s perfect for me. But I have short hair (like Ellen DeGeneres). Do you think this would work for me? No, unfortunately the hair brush wouldn’t be able to grab your hair. It’s a big barrel. 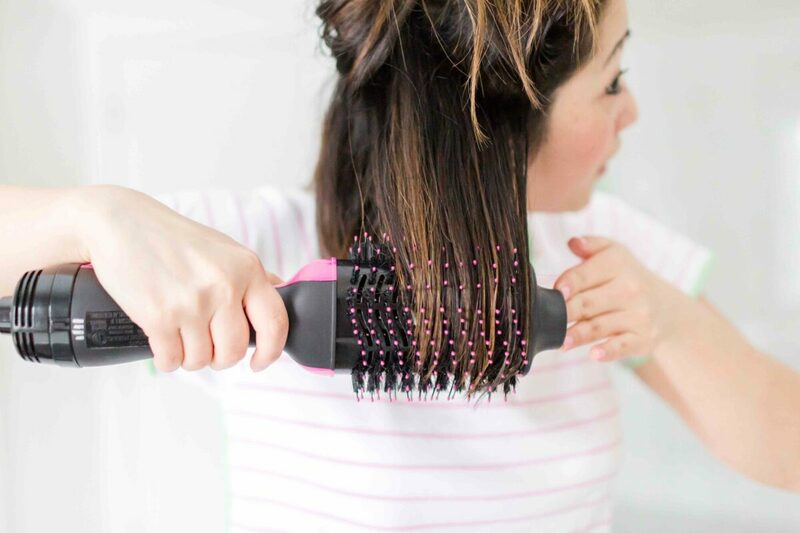 Will you be posting a photo of your hair style after using the hot brush? Is it more of a bob or can you actually get spiraling or loose curls? It’s a hair dryer so doesn’t give you curls. It just dries my hair straight and volumnized. 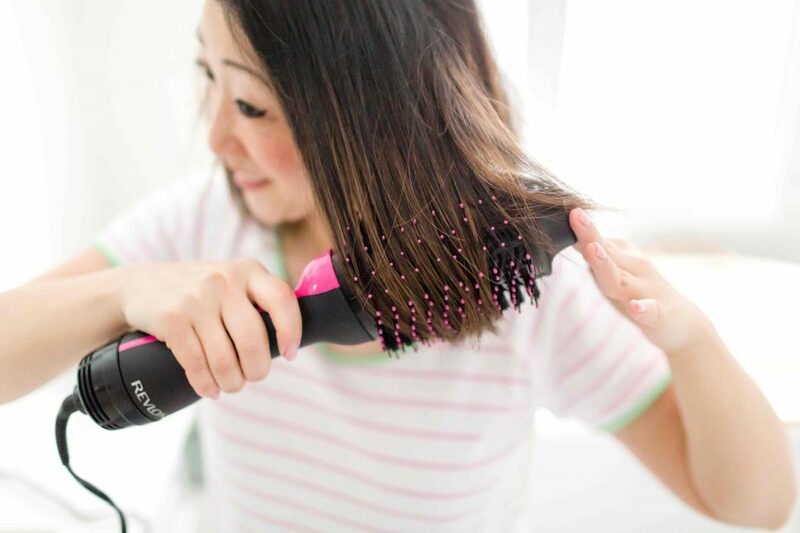 This tool will not replace my flatiron… BUT it is still awesome and worth it. It has completely replaced my hair dryer and round brush. Easy to use and does a fantastic job with volumizing my hair. I still use my flatirons afterwards for smoth finish and to control any flyaways but really happy I bought this tool! Yes, this tool doesn’t replace my flat iron either. It’s simply to dry my hair! I have short hair and need a smaller barrel. Do you know if it comes that way? I just got one from Target! I’ve read they break easily and for no apparent reason. Have you experienced this? How can I avoid it? Oh no, that’s a bummer. I have not experienced it. I use mine 3-4 times a week and I actually recently traveled with it. Just put it in my suitcase and it was totally fine. No advice on how you can avoid it. Perhaps just use it carefully and don’t put a lot of abuse on it?